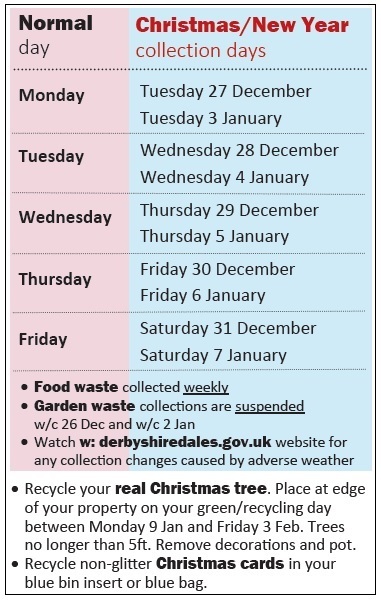 The below information tells you everything you need to know about your waste collections over the Christmas and New Year periods. This information is specifically for residents of Elton, Gratton and Winster. If you live in a different village or town, please read the below information and then refer to the waste collection calendar at the bottom of the page to see when your collections is. Alternatively, all Derbyshire Dales residents can use the District Council’s website to see what bins and containers to put out and when. Please click here to view the ‘When is my collection’ page. Simply type in your postcode, select your address and you will have all the information you need. Your Christmas and New Year waste collections in the two weeks after Christmas Day are ONE DAY LATER than usual. Christmas Day itself falls on a Sunday this year, so in the week running up to Christmas your bins will be emptied as normal. Waste collections will not take place on Boxing Day. Instead, waste will be collected one day later in the week after Christmas. Waste normally collected on Monday 26 December will be collected on Tuesday 27 December and so on. Crews will work on an extra day on Saturday 31 December and Saturday 7 January to make sure all waste is collected on those weeks. This is the same system that works during a Bank Holiday week which residents should be familiar with. Elton and Gratton residents who normally have waste collected on Wednesday will have their waste collected on the Thursday in the two weeks after Christmas. Thursday 29 December 2016 – YES, your waste will be collected!! This includes collection of your blue bin/box and bag plus your weekly food caddy collection. Garden waste collections have been suspended this week. Thursday 5 January 2017 – YES, your waste will be collected!! This includes collection of your household waste (grey bin/black sacks) plus your weekly food caddy collection. Remember – waste collections can be effected by adverse weather (such as heavy snow or ice). If this is the case and waste collections are delayed or cancelled, leave your bins and containers out for collection. Your waste collection crews will return to collect them as soon as it is safe and practical to do so. Waste crews are unable to collect excess household waste at any time – especially at Christmas. So, please make sure all your household waste is contained in your grey bin (with the lid shut) or in four black standard sized sacks if you are on a sack collection. Excess household waste should be taken to the household recycling centre at Darley Dale. Crews can take excess recycling. Simply place any additional material at the side of your recycling container(s) making sure it is easily identifiable as recycling material and suitably contained. Use trans-parent containers (such as stacker boxes) rather than black bags so that the content can be identified easily. Recycle your real Christmas tree. Place at edge of your property on your green/recycling day between Monday 9 Jan and Friday 3 Feb. Trees no longer than 5ft. Remove decorations and pot. Recycle non-glitter Christmas cards in your blue bin insert or blue bag. The District Council offices will be closed, but your report of a missed bin will go directly to the waste collection contractor who will follow this up. If you do not have access to the internet or have major problems with your waste collection over the festive period, you can contact your local District Councillor.